April 7, 2016 By Claire Davidson & filed under Blog. Working out at a gym can be both expensive and time consuming. Often, in the time it takes you to drive to the gym, you could have accomplished an entire workout. Since we’re all about saving time and money, we bet you are too. And luckily, working out at home no longer means you need a dedicated space in your home – or piles of workout DVDs. You can now work out in your living room or on-the-go using any device by streaming workouts right to your laptop, Apple TV, Chromecast, and more with Get Healthy U TV. 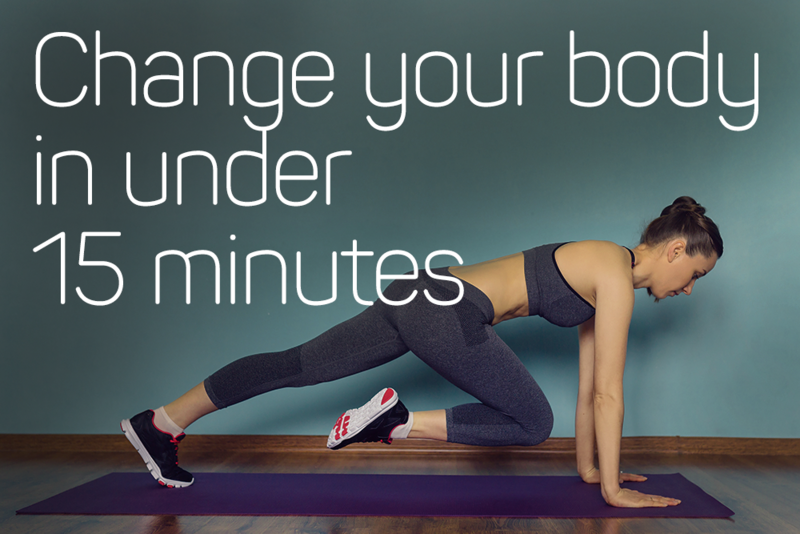 Here are four of our favorite at-home workouts you can do in less than 15 minutes – oh, and did we mention they’re free? Try one today to get your heart pumping without driving to – or paying for! – the gym. It’s a well-known fact that HIIT workouts are more effective at burning fat and helping you get in shape than lower intensity workouts. They help you work harder, not longer, and should be an essential component to your weekly workouts if you want to increase your fitness level and/or lose weight. Tabata is a form of HIIT training that utilizes intervals of 20 seconds of all-out effort followed by a quick 10 seconds of rest. You repeat these high-intensity intervals eight times in a row to get your heart rate up and burn more calories in less time. This Tabata-style HIIT workout will work your entire body, from your glutes and legs to your abs, biceps and shoulders – giving you an intense, total body workout in just ten minutes. For more HIIT workouts, click here! If you’re looking for a quick, total body workout, this circuit workout is the one for you. Circuit workouts use intervals to get your heart rate up and improve both your cardiovascular fitness and build strength. In this circuit workout you’ll perform 45 seconds of work followed by 15 seconds of rest, starting with moves like alternating lunges with overhead presses. You’ll move on to plyometric work with squat jacks, and perform other total-body moves like push-ups with alternating punches. If you thought you couldn’t get a complete workout in 10 minutes, you’ve never tried this mini circuit workout. For more circuit workouts, click here! If you’re ready to work your abs but sick of repetitive crunches, this fun ab crusher workout is for you. You’ll grab a set of dumbbells – yes, you’ll use weights for this ab workout! – and get ready to do intense ab intervals of 45 seconds of work followed by 15 seconds of rest – just enough to transition onto the next exercise. With moves like Russian twists, side plank twists, and dolphin dives, you’ll give your core a total workout. Chris will explain how each move helps you sculpt both your obliques as well as those low abs – the transverse abdominus – giving you a defined, stronger core. For more ab workouts, click here! This Pilates-inspired workout will not only help define your abdominals but also strengthen and lengthen your entire body! Moves like bicycle crunches, total body roll-ups, and Pilates 100s will engage your transverse abdominus (those low abs we all want to define and flatten!) and obliques, while bringing your arms and lower body along for the ride for a workout that will leave you feeling strong and accomplished. Pilates is great for building strength through controlled movements, and if you have 10 minutes, you can get a great Pilates-inspired workout to define your core and strengthen your entire body. For more Pilates-inspired workouts, click here! If you were a fan of these workouts, you’ll love Get Healthy U TV. It’s a simple online program that allows you to stream dozens of workout programs from the comfort of your own home, on any device you want, as much as you want. We have dozens of of program-specific and combination workout calendars to tailor to your individual fitness goals, making it easy to know exactly what to do each day to get in shape and get the results you want. Get in shape without breaking the bank or wasting time – make sure to check out all that GHUTV has to offer!